Thanks in large part to the excess levy approved by school district voters in April, the 2003 property tax levy for the School District #741 is expected to increase. The school district should receive around $520,000 from the excess levy for the 2003-04 school year, as well as $52,000 in equity aid from the state. Of the $520,000, the local tax levy will account for $277,500 (53 percent) while state aid will account for $242,500 (47 percent). This addition is the biggest addition to the proposed 2003 tax levy for the school district, which was approved by the school board on Tuesday, Sept. 24. 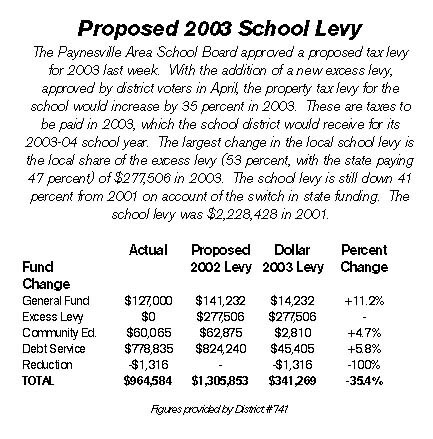 In all, the local tax levy will increase $341,000 from 2002 to 2003. "You can see it's quite an increase, but we would expect it to be," said superintendent Howard Caldwell at the school board meeting last week. Another large increase is due to a decline in state aid towards debt service, the portion the school levies to pay back bond issues. When district voters approved the $3.4 million bonds for the auditorium and fitness center addition in 1999, 46 percent of that bond issue was expected to be paid by state aid. Taking into account the school's previous bond issue from 1993 for the new middle school and the elementary school remodeling, over 37 percent of the school's debt service over the next 20 years was expected to be paid by state aid. In fact, the state contributed $192,000 towards debt service in 2001, out of $914,000 needed by the district, only 21 percent. Last year, state aid dropped to just under $77,000. Thanks to a bond refinancing - which saved the district around $55,000 per year - the school district only had to pay $856,000 in debt service that year, with the state's contribution amounting to nine percent. For 2003, state aid is expected to be only $34,000, meaning the local contribution needs to be $824,000 to service the debt. State aid will cover only four percent of the debt service payments. This loss of state aid means an additional $45,000 will have to be put on property taxes in 2003. "That's the drawbacks of any of these (state) programs," Caldwell told the board. "It can be changed in any one legislative session." Another increase in the proposed tax levy for 2003 is for safety. Schools can now levy $30 per pupil unit for safety, up from $11 per pupil unit last year. Last year, the school district levied $15,000 for safety, and it is proposing to levy $39,000 in 2003. There is no plan yet on how to spend this money, though, said Caldwell, and board member Mark Dingmann asked that a plan be in place by December for this money or it be eliminated from the levy. The proposed levy will be used for the district's Truth-in-Taxation hearings in December: on Tuesday, Dec. 3, at 7 p.m. and on Tuesday, Dec. 10, at 7 p.m., if necessary. The school board will pass a final 2003 tax levy in December.